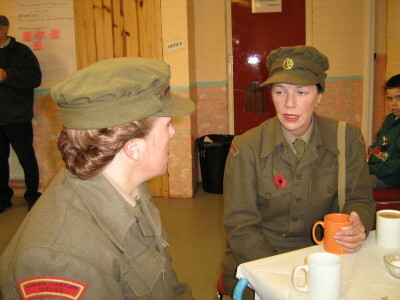 By request here are the recipes used by Cilla for the wartime food at the Celebration Event. 1. Rub butter and flour until it looks like breadcrumbs, add the sugar and fruit. 2. Mix up to form a stiff batter by adding the beaten egg and milk. If it looks too dry, add one more table spoon of milk to the batter. 3. Place 10 spoonfuls of the batter onto a well greased baking sheet, they should look rocky. Make sure you leave some room between the cakes as they will spread slightly. 4. Bake at gas mark 6 for 15 to 20 minutes and then cool on a wire rack. 1. Beat together the sugar and the margarine until the mixture is soft and creamy, and then add the honey. 2. Sift together the flower and the cinnamon. Add to the creamy mixture using a spoon until it binds together. 3. Work it with your fingers until it is a soft, smooth dough. 4. Flour your hands, take off a piece of dough about the size of a large walnut and roll between the palms of hands until it is a smooth ball. 5. Put onto a lightly greased tin and flatten slightly. Continue until all the dough has been used up. 6. Bake in a moderately hot oven until the cakes are done – approximately 15 minutes. 1. Mix the flour, dried egg and sugar. 2. Rub in the margarine. 3. Add the raisins, essence and enough milk to bind into firm dough. 4. Roll out thinly and cut into 2 inch rounds. 5. Cook in the centre of a moderate oven for 20 minutes. 1. Grate the carrots and cook them in a bit of water for 10 minutes. 2. Add the orange essence. 3. Melt a gelatine leaf and add it to the mixture. 4. Cook quickly for a few minutes stirring all the time. 5. Spoon into a flat dish and leave to set. 6. Cut the fudge into cubes and eat!! 12 Tablespoons Self Raising Flour. 1. Cream the margarine and sugar together until light and fluffy. 2. Beat in the flavouring and the carrot and fold in the flour. 3. Drop spoonfuls of the mixture into greased patty tins and sprinkle the tops with a little sugar. 4. Cook in a moderately hot oven for 20 minutes. 1. Combine flour, oats, sugar and coconut into a bowl. 2. Melt the butter and the golden syrup in a pot over a low heat. 3. Mix the bicarbonate of soda with water and then add to the butter and golden syrup mix. 4. Pour the liquid mixture into the dry mixture and mix well. 5. Teaspoon dollops of the mixture onto a greased tray leaving space for spreading. 6. Bake at 180˚c (or 350˚f) for 15-20 minutes. These biscuits are named after the Australian and New Zealand Army. Instead of using eggs golden syrup was used. These biscuits would keep fresh for a couple of months which is often how long they took to reach the army in the far away countries they were based. 1. Soft boil the white cabbage and put through a mincer together with boiled potatoes. 2. Add salt, pepper, caraway and breadcrumbs. 3. Mix well, shape into small sausages, and fry in a little fat. 1. Mix flour and baking powder. 3. Then add sugar and grated beetroot. 4. Now mix all the ingredients to a soft cake consistency with 3 or 4 tablespoons of milk. 5. Add a few drops of flavouring essence if you have it. 6. Turn the mixture into a greased pie dish or tin and bake in a moderate oven for 35 minutes. This pudding tastes equally good hot or cold. 1. Set oven to Gas mark 4/5 or 160˚c. 3. Slowly melt butter and syrup. 4. Add approximately 20 dessert spoons of warm water. 5. Stir mixed dry ingredients with the butter mix. 6. Pour into two greased sandwich tins. 7. Bake for approximately 25 minutes until light and spongy to touch. 8. Once cool, sandwich together with strawberry jam and top with sieved icing sugar or chocolate icing.